electrical energy in the form of high energy electrons. chemical energy in the bonds of ATP. stored in the chemical bonds of sugar molecules. 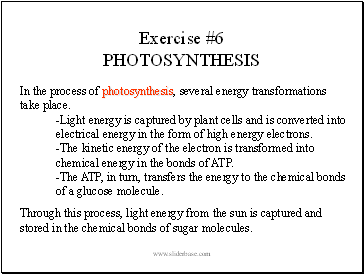 energy by the photosynthetic pigment, chlorophyll. the visible portion of the electromagnetic spectrum. portion of the electromagnetic spectrum. reflected by the chlorophyll molecule. 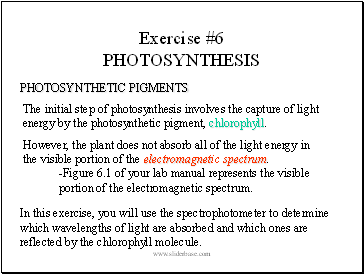 by chlorophyll, you must first separate the pigment from the leaf tissue. 1) Place a large spinach leaf into a 50 ml beaker and add 30 ml of ethanol. leaf or boil the ethanol solution. 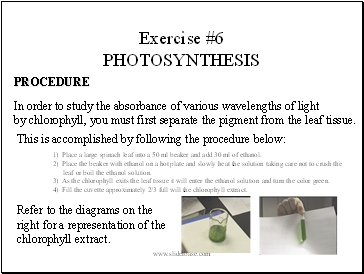 3) As the chlorophyll exits the leaf tissue it will enter the ethanol solution and turn the color green. 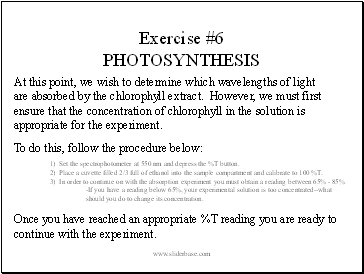 4) Fill the cuvette approximately 2/3 full will the chlorophyll extract. 1) Set the spectrophotometer at 550 nm and depress the %T button. 2) Place a cuvette filled 2/3 full of ethanol into the sample compartment and calibrate to 100 %T. 3) In order to continue on with the absorption experiment you must obtain a reading between 65% - 85%.